What? I’d just checked two hours earlier with the policeman on duty back at Surin bus station, and he’d told me the situation was calm, so I’d continued on towards Preah Vihear; now this motorbike driver at Kantharalak bus station was telling me Preah Vihear was off limits again… maybe he was bullshitting me to somehow get a longer fare or something? Smartphones didn’t quite exist yet at that point in time, so I wasn’t even sure what park he was referring to and couldn’t check. The Lonely Planet guide hadn’t explained much other than that the temple could be reached by motorbike from Kantharalak station, and that the Cambodian border guards would allow people to enter from the Thai border for a few hours and for a small fee as long as they left the same way the same day. And that’s what all the controversy is about, as it so often is; a border. An abstract concept, an artificial line on a map, argued over between two nation states, themselves abstract concepts, over who should get this island or that rock, or as at Preah Vihear, that temple. 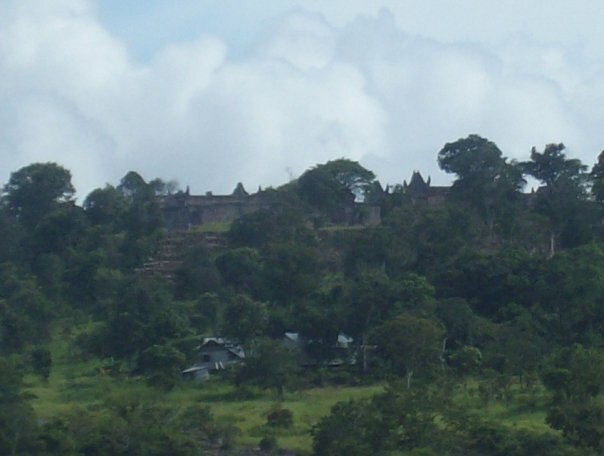 The controversy surrounds the Preah Vihear temple complex, a Khmer temple built atop the Pha Mo I Deang cliff in the Dangrek mountains at a time when the Khmer Empire (i.e. 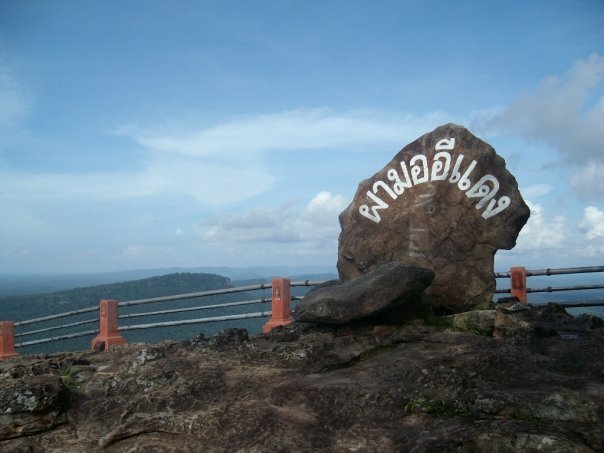 ancient Cambodia) once scaled the cliffs and conquered the Isaan region, now northeast Thailand. 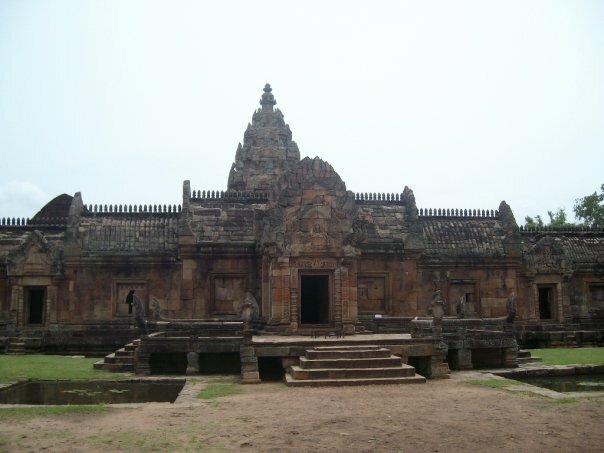 The Khmer built several large temple complexes in Isaan, smaller in scale but similar in style to their great monuments at Angkor Wat (the most notable examples are Phanom Rung and Phimai (both located well within Thailand) and the disputed Preah Vihear right on the border). When the French came along and subjugated the Khmer along with the Vietnamese and Lao (and the various other peoples living in what are now Cambodia, Vietnam, and Laos), the cliff formed the border between French Indochina and independent Thailand. 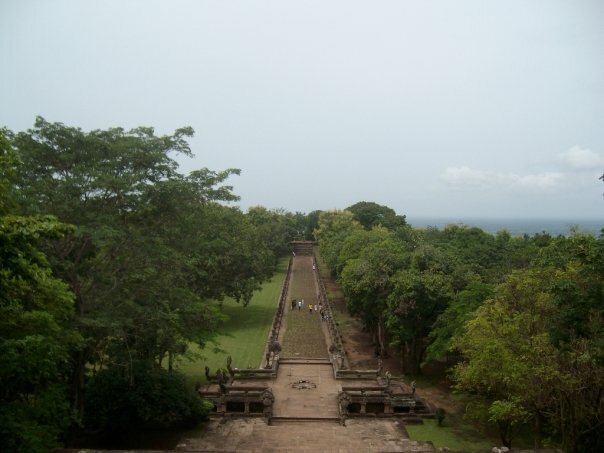 However, France fancied the Preah Vihear temple complex with its commanding cliff top position, and drew up a map showing the clifftop watershed as the Thailand – French Indochina border, but with the border deviating from the watershed to loop around the temple structures and the crest in the ridge they stand upon, placing it on French territory. Thailand appears to have accepted the map at that time, which was the main basis for the arguments and rulings eventually made at the ICJ (see below). 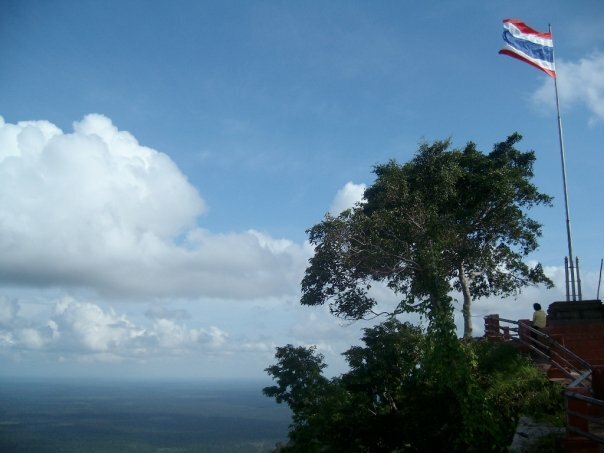 When the French left Asia after World War II, Cambodia claimed its independence and Preah Vihear – a piece of their Khmer heritage – along with it, as per the French map; but the Thais saw the clifftop land as rightfully theirs, an inherent part of Thailand, and not France’s to give or take. 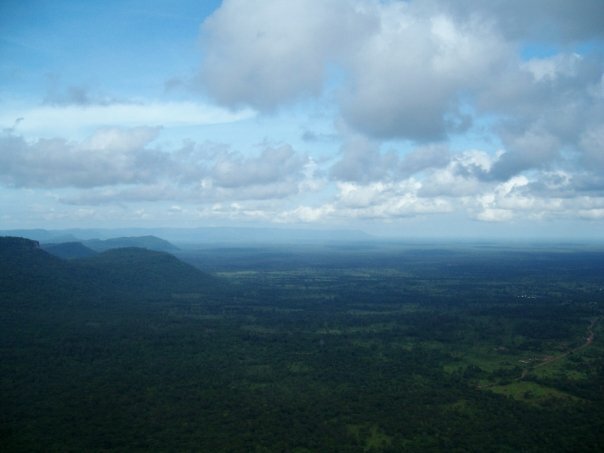 The dispute was eventually submitted to the ICJ at the UN, which ruled that Preah Vihear was part of Cambodia. The result is that Thailand has all the cliff top territory save for the band of border looping from the cliff around the temple complex. Bizarrely until very recently there was no proper road access on the Cambodian side, whereas the Thai side has a good road directly to the site; this meant that despite being officially in Cambodia, the temple was for decades far more easily accessed from Thailand. Despite the dispute, an agreement was in place whereby visitors could enter Cambodia visa-free for the day from Thailand (no entry / exit stamps were issued by either party; visitors were simply allowed into Cambodia and then back to Thailand); and so, when it turned out I’d be travelling through Isaan en route to Bangkok after visiting Laos’ 4000 Islands, the alluring combination of dramatic scenery, ancient architecture, and international disputes meant that Preah Vihear was at the top of my Isaan list. I knew the situation and I knew to get the latest info before heading to the temple, and yet I managed to time my visit for the exact day that the dispute flared up again in the summer of 2008 as tensions ran high due to Preah Vihear being recognised as a UNESCO World Heritage Site, leading to a series of troop movements, arrests, landmine explosions, and ultimately exchanges of artillery and gunfire later that year and again in 2011, with multiple casualties on both sides; for some reason the policeman at Surin station hadn’t been aware of this, and so I found myself hiring a motorbike driver to take me to look at a live conflict zone. 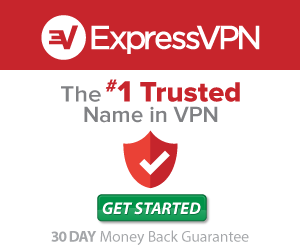 Dumb move? 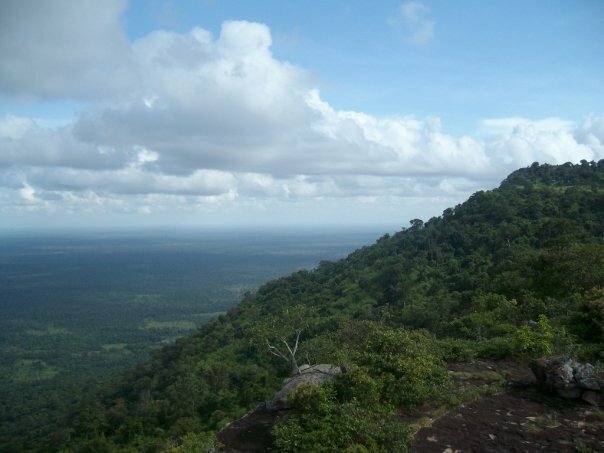 Could’ve been, I suppose; but my man said he’d take me to Khao Phra Wihan National Park adjacent to the temple site (the park was still open and out of the line of fire), from where I could see Preah Vihear from a distance while taking in the views of northern Cambodia below. Better than nothing I guess, but it sucked to travel all that way only to come up so tantalisingly short of the goal! I did see Preah Vihear, but from such a distance that it was hard to really make it out. However, the cliff top views were awesome, and so it didn’t feel like a completely wasted effort; still, it’s a place I’d like to go back and visit properly. In order to do so, these days the site can be much more easily visited from the Cambodian side than previously; with a new paved road having been constructed to the foot of the cliff, and a steep road actually running up to the temple, it’s now possible to travel to Preah Vihear as a (long) day trip from Siem Reap (involving a journey of 3 hours plus, each way); visiting from the Thai side may become possible again, but at time of writing in 2017 has not yet done so. The following day I did visit one of Thailand’s Khmer temple sites, that at Phanom Rung (and nearby Muang Tam), which also stands in a commanding position above the surrounding plains (in this case, atop an extinct volcano). I visited both Phanom Rung and Khao Phra Wihan National Park as day-trips from Surin, using a combination of public buses then songthaew or moto from the bus stations to the sites. Getting to Khao Phra Wihan park (to view Preah Vihear) is quite a mission from Surin to be honest, but do-able as a day-trip involving a bus to Kantharalak and private transportation from there (the city of Ubon Ratchathani is a closer base for reaching Kantharalak). For Phanom Rung, Surin is the closest major city and Nang Rong the closest town; buses connect the two and you can base yourself in either, with private transportation available from Nang Rong to the ruins. I actually took a songthaew to the nearest drop-off point, which still left me with a fair hike up to the site which I can’t recommend in the heat & humidity – a moto or taxi is a better idea. Returning, I randomly managed to catch a ride to a highway bus stop with a friendly Belgian couple who had a private vehicle & driver for the day (who refused any payment other than a round of cold drinks). Have you been to Preah Vihear (from either side)? How was it? Leave me a comment below!